Ms. Marvel issues are typically self-contained, with very little impact to and from other books in the Marvel Universe, and this issue is no different. Her issues usually only involve her family, her peers and any villains that seem to be causing trouble in Jersey City, where she lives. She is very much the ground level superhero in her own title. 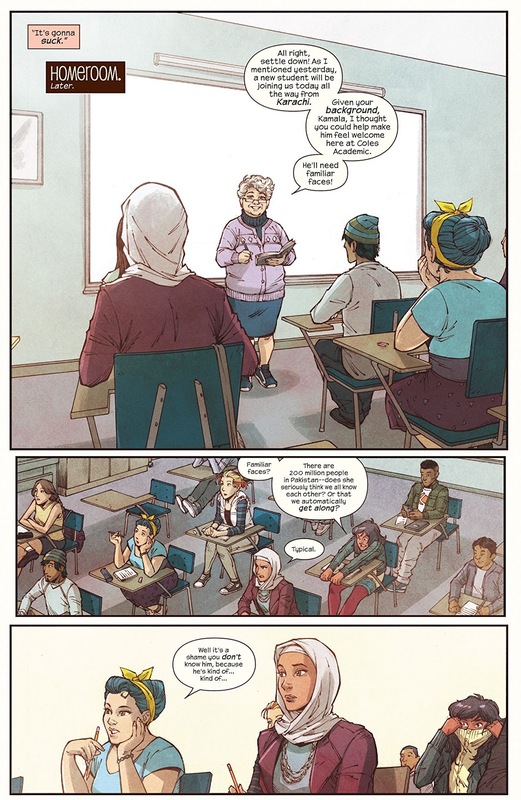 Writer, G. Willow Wilson, doesn’t seem to be going in a Marvel Legacy style beginning to this arc. It’s a nice change of pace for readers, like myself, who are also invested in larger Marvel Universe impacting heroes. Coming from what happened in the previous arc with Discord and the agency of K.I.N.D., this arc seems to be more lighthearted filler. 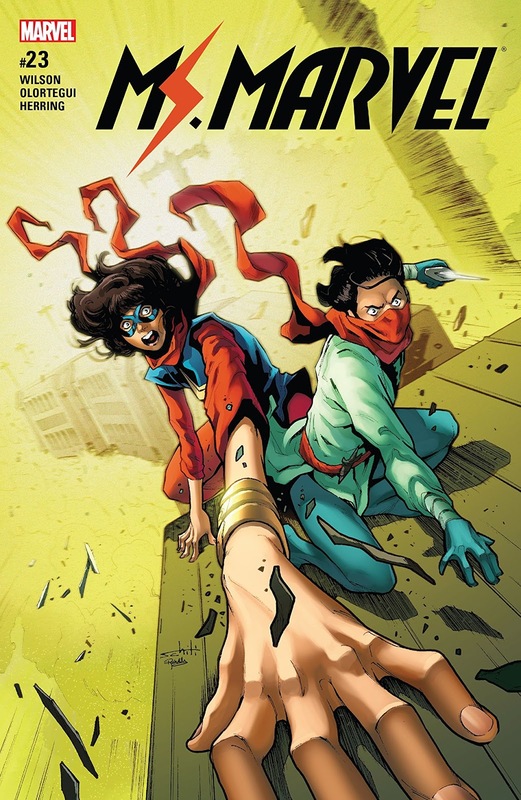 I was annoyed with the forced conflict with our hero and the other character on the cover, who we haven’t seen since Kamala’s trip to Pakistan. Is this another team up? Is he here to cause trouble for our title hero? Let’s find out. 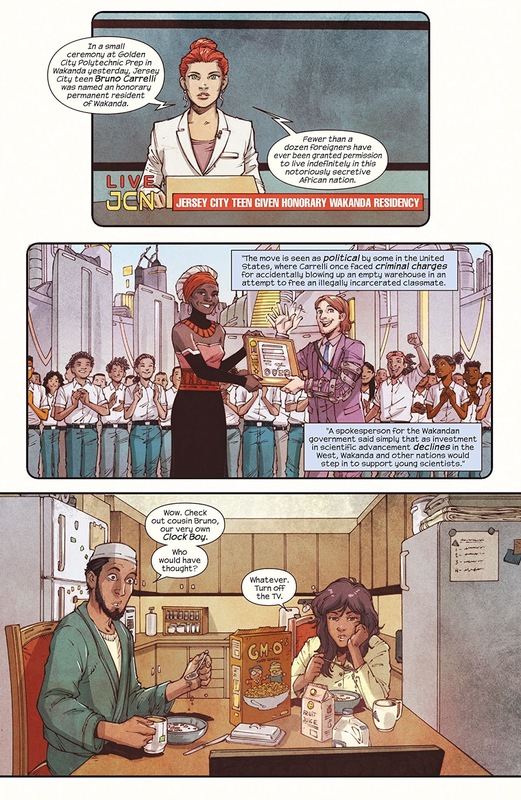 The issue begins with Kamala and her brother, Aamir, watching the news and eating GM-O’s cereal (get it?). Kamala asks Aamir to turn off the television when her ex-best friend, Bruno, is on receiving permanent residency in Wakanda. The following news report is about a power failure on a railway, which foreshadows what our hero will be dealing with later in the issue. Next, we get a nice sibling moment when Aamir says he has to begin packing his stuff because he and his wife, Tyesha, are going to be moving to their own place. Kamala then says she needs to get ready for school and that her class is expecting a new Pakistani student. 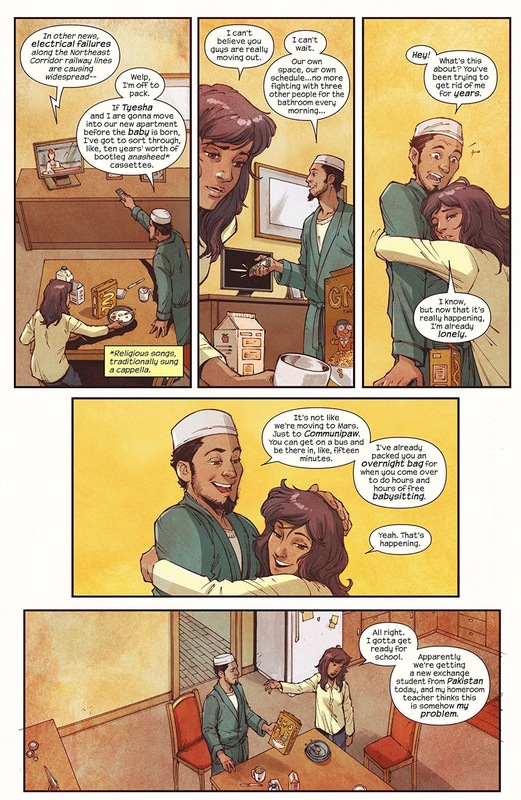 In homeroom class, the teacher introduces the new student, Kareem, who appeared in previous issues when Kamala made a short trip to Karachi, Pakistan. Kamala is surprised to find out that the new student is someone she knows, while her friends (especially Mike) drools over him. After the introductions, we hear a train blasting it’s horns begging for help. 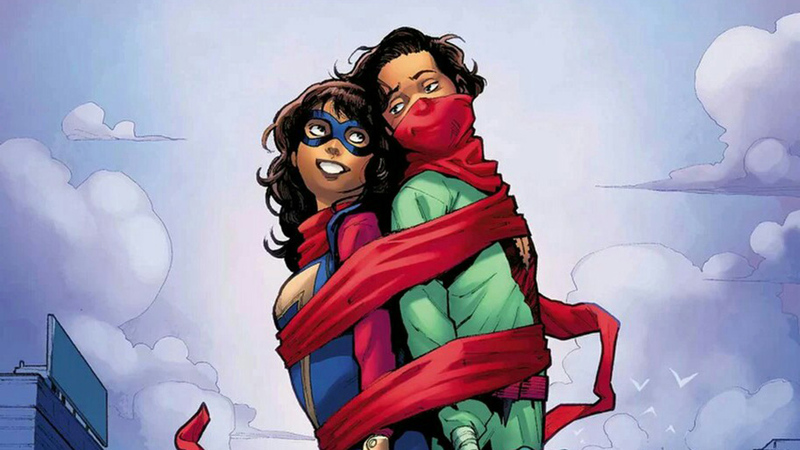 Our hero states that after what happened in the previous arc, she has been afraid to be Ms. Marvel lately, but she claims the natural instinct to be a hero is very strong at this moment, stronger than her fear, so Kamala does the cliché “need-to-go-to-the-bathroom-so-I-can-secretly-go-be-a-hero” thing. Kareem also states he has to use the restroom and quickly runs off. Ms. Marvel catches up to the front of the train and asks the conductor what the situation is. It seems the power failure earlier caused the electrical brakes to stop functioning and that the use of the emergency brakes will cause a pile-up, even though the train is travelling at a consistent 25mph. While Ms. Marvel is trying to come up with a plan, we see Red Dagger (who has appeared in previous issues) jump onto the top of the train with her and both heroes are surprised to see each other there. After a Gumby-transformed Ms. Marvel and a few character discussing panels, the two heroes are quickly put into a situation where Ms. Marvel had to ask Red Dagger for help and he obliged. After successfully preventing the slow runaway train from crashing, the workers nearby praise both heroes, but more praise going towards Red Dagger and this upsets our main hero. She is so upset by this that she quickly feels the need to get off the train and have some retail therapy at a nearby YaYa convenience store and informs Red Dagger she is going to catch up. Shopping inside the store doesn’t help Ms. Marvel get away from him, as we have a couple of new Red Dagger fans telling her how happy they were to have a new hero in their part of town. When our hero finally gets back to the train, Red Dagger says he has a plan, but the conductor quickly cuts him off to tell them that there is an oncoming express train coming through the tunnel that they will be going into. The issue ends in a panel with our heroes on top of the slow runaway train about to enter the tunnel with headlights of the oncoming express train in the distance. Olortegui is a welcome addition to the Ms. Marvel art team and Herring’s colours are just as good as they’ve always been on this book. The art is very reminiscent of Miyazawa’s style in previous issues, that Olortegui’s style fits right in. I had no issues with the art and overall really enjoyed Olortegui’s style for this book. I look forward to seeing more of it in the coming issues. G. Willow Wilson continues to keep Ms. Marvel in her own self-contained story within the Marvel Universe with this issue. This arc is a palette cleanser after what happened in the previous arc and I do find Kamala struggling internally with being Ms. Marvel interesting, but her jealousy over Red Dagger’s quick popularity to be way over the top. If you enjoy the usual silliness of Ms. Marvel filler issues, you’ll enjoy this one, especially with beautiful art from Olortegui to show it.